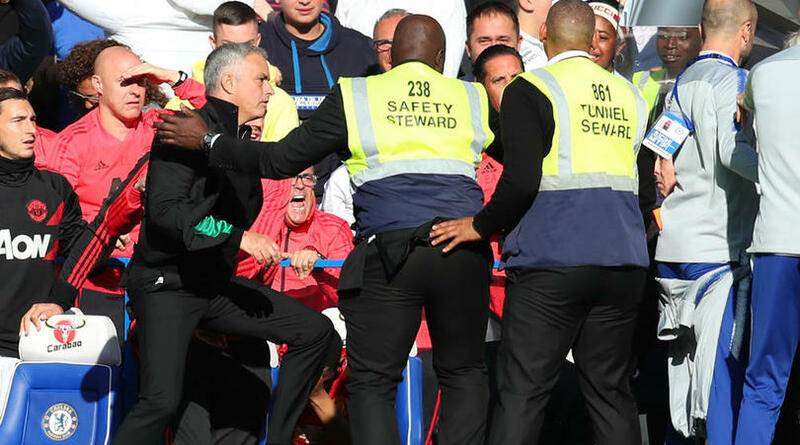 A furious scuffle involving Jose Mourinho and the Chelsea coaching staff erupted at the end of Saturday’s 2-2 draw at Stamford Bridge between the Blues and Manchester United. After the final whistle, Mourinho went to applaud the United fans before holding up three figures to the home support – apparently in reference to the three Premier League titles he won during two spells as Chelsea manager – after they had taunted him with chants following Barkley’s leveller. United were 1-0 down thanks to Antonio Rudiger’s first-half header, but produced an impressive comeback after the break, with Anthony Martial scoring twice to put them ahead. It appeared as though Chelsea were heading for their first competitive defeat under Maurizio Sarri until Barkley turned in a rebound after David Luiz’s header hit the post and David de Gea denied Rudiger. ‘No, I’m not annoyed with anything,’ he said.